12 days Vaikasi Visakam in May-June drawing a huge crowd of devotees exceeding 10,000; 7 days Skanda Sashti in Aipasi-September-October; 4 day Panguni Uthiram (March-April); 3 day Thaipoosam in January-February are the very great festivals celebrated in the temple. 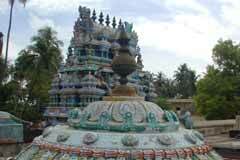 Lord Muruga created a tank here with His weapon Vel to worship His parents. Lord Nataraja appears here as Soorathandavamurthy. The temple is opened from 6.00 a.m. to 01.00 p.m. and 03.30 p.m. to 09.00 p.m.
Sri Subramanyaswami Temple, Vayalur- 620 102, Trichy Dist. +91 431 2607 344, 98949 84960. Lord Muruga appears here to teach the great lesson that one should know that the first Gods are the Mother and Father. He is seen praying to Lord Shiva and Mother Parvathi to illustrate this great lesson. Vayalur is the holy place where Lord Muruga blessed sage Arunagiri with the gift of pouring countless hymns in praise of Him, Tirupugazh, Kandar Anubhuthi, Kandar Alangaram etc. in chaste Tamil of highest poetic and spiritual standards. Every word in the hymns of Arunagiri is an outpouring of his God Realization experience which cannot be thought of or attempted even by the best poet lauerate of the language. They are spontaneous in nature. Sri Kripananda Variar: The great scholar and devotee of Lord Muruga, Sri Kripananda variar deserves to be regarded as the Arunagiriar of the 20th Century. He brought Vayalur great fame through his speeches and writings on Thirupugazh, Skanda Mahapuranam etc. He would begin his lectures only after offering his prayers to Lord Muruga of Vayalur. The two Vs Sri Variar and Vayalur are inseparable. Those inflicted with Naga dosha (aspect of snake) use to have a dip in the tank in the temple and worship Lord Muruga for a relief. Obstacles in marriage also disappear. Vayalur is considered great among the many centres of worship in the state of Tamilnadu. Devotees throng here for cure from diseases, children, longevity, education, wisdom, prosperity, good farm yields. Tonsuring, ear boring, carrying milk pots and Kavadi, observing Sashti fasting, rolling round the temple for cure from diseases are the commitments devotees undertake in the temple. Shanmugarchana (praising Lord Muruga with sacred names with flowers) Shanmuga Yagna, feeding the poor, offering donations for temple maintenance and renovation are also undertaken by devotees suiting to their purse. 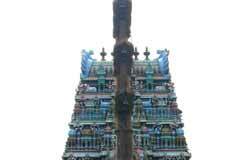 Lord Muruga worshipped Lord Shiva here. A Shiva temple with more prominence to Lord Muruga. The peacock (vehicle of Lord Muruga) is facing north in the sanctum sanctorum known as Deva Mayil (divine peacock). While the Goddess is seen facing North in almost all Shiva temples, Mother Adhinayaki here is facing South. 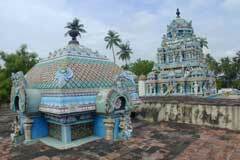 Lord Muruga created a tank here with His weapon Vel to worship His parents. Lord Nataraja appears here as Soorathandavamurthy. 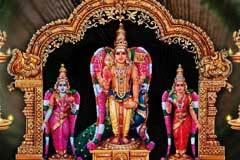 Lord Muruga gave darshan to Arunagiriar in his wedding form. 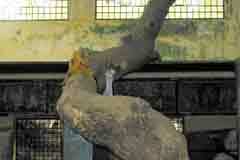 Hence worship in the temple would facilitate marriages delayed earlier. 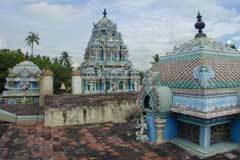 Sage Arunagiri had special attachment to this temple as he gained his poetic skill with the blessings of Lord Muruga here. 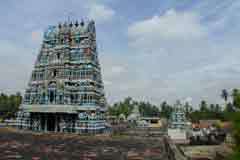 A temple made famous with the painstaking efforts of Sri Kripanandavariar. 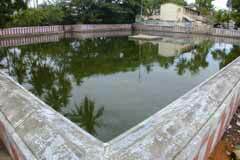 The Shakthi Theertham, the holy spring was created by Lord Muruga with His Vel. According to a hearsay story, a Chola King came to this spot in search of water to quench his thirst after long hunting. He found a sugar cane with three branches and wanted to squeeze and drink the juice. When he broke it, blood sprang from the Sugarcane and after digging the ground, a Shiva Linga was found. The king built a temple on the spot. After protecting sage Arunagiri when he fell from the tower of the Tiruvannamalai temple, Lord Muruga gave the first line to enable him to sing His praise and directed him to come to Vayalur. Arunagiriar came to Vayalur, worshipped Poyya Ganapathy and had the darshan of Lord Muruga-Subramanya. Lord Muruga wrote the Pranava Mantra on the tongue of Arunagiriar with his weapon Vel. In the long volume of Tirupugazh, Vayalur has a special place of importance. It is due to the personal devotion and dedication of the great Muruga devotee Sri Kripanandavariar, who lived in the last century, Vayalur came to be known as a temple of great reputation among the Muruga temples in the state of Tamilnadu. There are a number of private lodges in Trichy also which is just 11 kms from Vayalur. 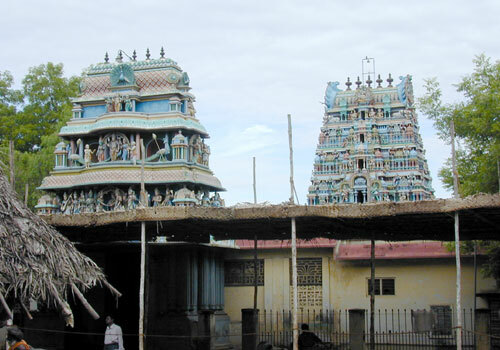 Being close to Trichy, Vayalur temple can be reached easily with bus facilities.